I'm testing out Web Connection 7.0 and the wwSQL.prg class. Upon doing oSQL.Connect(), I'm getting an error stating "Property SETASYNCHMODE is not found." THIS.SetAsynchMode() is called from Connect(), but the method doesn't exist in the PRG. 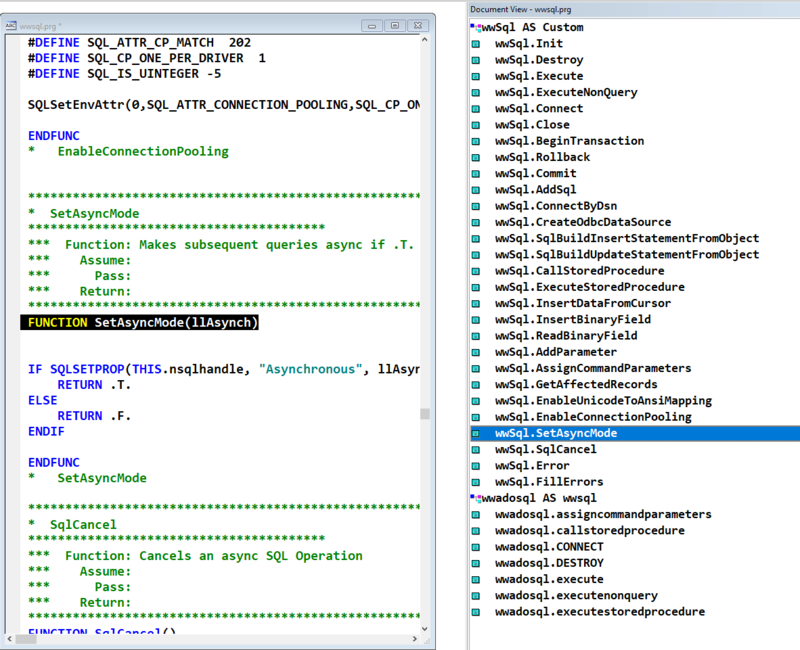 I can see the SetAsynchMode method in the wwSQL.vcx visual class library, but WC version 7.0 is not using that library. BTW, thanks for reporting all these little things. 7.0 had a lot of big behind the scenes changes and while I do my best to test for all things there's so much surface in WWWC there are bound to be a few that fall through. I see most of it hit in my running applications, but the coverage is certainly not complete. Thank you - I appreciate the reports! Well, I wasn't searching for SetAsyncMode - I was searching for SetAsynchMode (with an 'h'), since that is what Connect() calls. This probably has been like this for a long time. I don't run any async SQL queries so I'd never see this. Additionally the error is caught and just goes on if you don't check the error message which really bites. Anyway - I fixed this and refactored that code to be a little cleaner while at it.